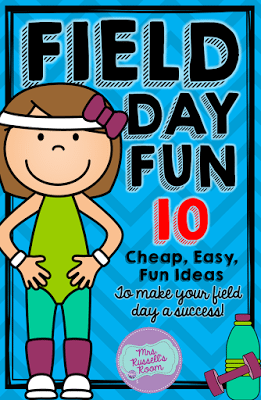 Does your school do field day? Our grade level does one every year. 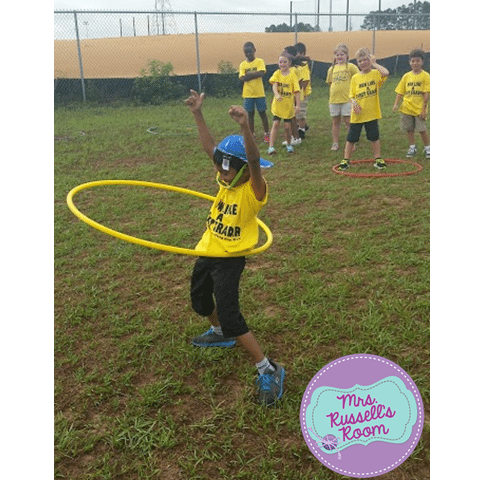 It’s so much fun for the kids and a great way to build grade level community. Something that I know has been a help on our team each year is to have a great plan early. We ask for help from our PE Coaches (equipment) and our parents (popsicles, water). We use the same types of activities each year so that it’s easier to plan. Here’s what we do! 🙂 Maybe some of these activities can be helpful to you in your field day! Each year, we’re given a schedule with our names in a grid like this. I took out the names of my teammates and added numbers so you could see how we did it. 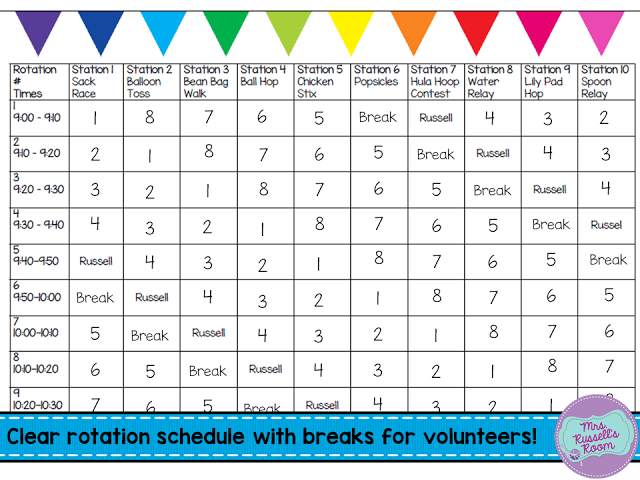 The parent volunteers get this paper too, so that they can see which classes should be coming to them, and when their station has a break. Every teacher and every station gets a schedule like this. There’s no confusion about how we rotate at all! 🙂 As you can see…there’s a tent in the center for water. The children can go there at any time. The activities are set up in an oval around the water tent. We rotate with our whole class to each center. 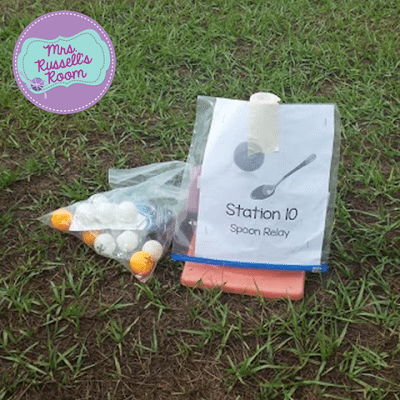 Ideally, we like at least one parent at each station, but if you have no parent support, each of these activities could be lead by the teacher before moving on to the next station. The kids break up into two teams. They jump into the large sacks and hop to a designated spot a few yards out and come back. The first team done is the winner! The students are put into pairs. Each pair shares one water balloon. When the teacher gives the signal, they toss the balloon underhand to their partner. 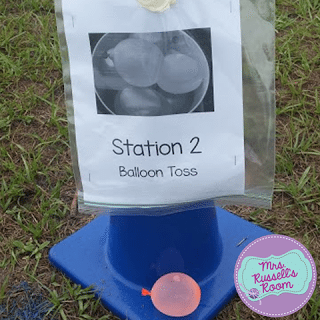 Those that still have a water balloon take a step back, and toss again on the teacher’s signal. Those who’ve lost their balloon are out. Play continues until one team has a water balloon. Students are broken into two teams. Each team is given a bean bag. They place the bag on their head. 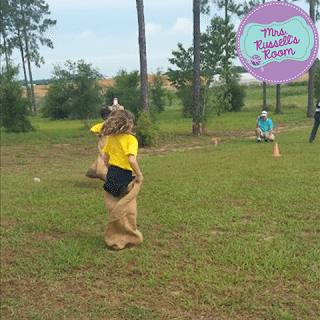 They race to a spot a few yards away–with the bag balanced on their head. Once one team is finished, they are declared the winner! Students are broken into two teams. Each team gets a beach ball. The student will place the beach ball between their legs. Then they will hop to a spot a few yards away and return to their team to ‘tag up’. The first team done is the winner. Students are broken into two teams. 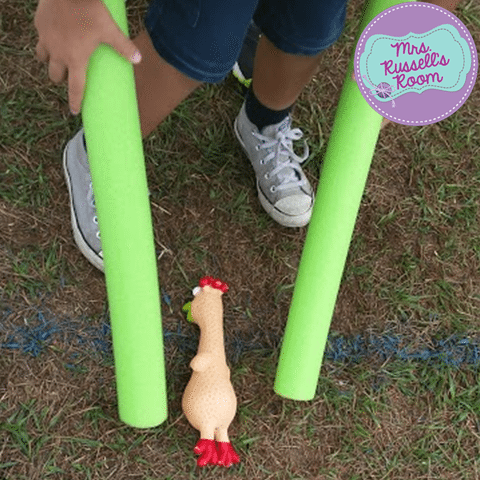 Each team has a pool noodle that’s been cut in half–these are the sticks. They use them to pick up the rubber chicken. They run to a spot a few yards away and return with the chicken for their teammate. The races continue until one team has had every student race. These are fairly cheap to get, and parents were more than willing to help. Here’s a different relay style game! 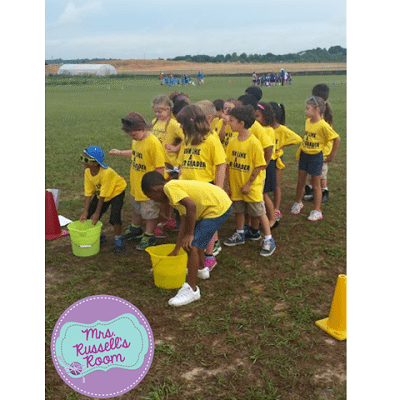 We had the students work together in teams to get water from one bucket to another using a large sponge! Once they got the hang of letting the sponge get full and THEN wringing it out in the other bucket…they got so excited!! It’s fun to watch them cheer each other on and work together! Our PE coaches helped us with these small rubber mats. We borrowed them for the event. This was like musical chairs. 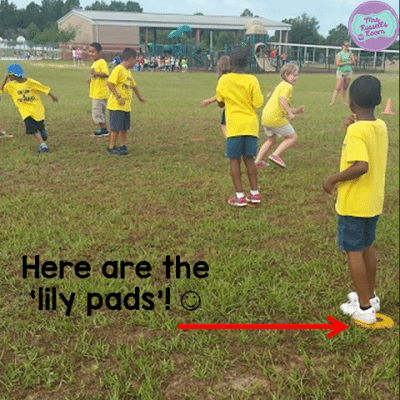 The students had to hop from one ‘pad’ to another for a few seconds. Then one pad was removed. The winner of this game is whoever is the last one standing. This relay was all about balance. The students were in two teams. 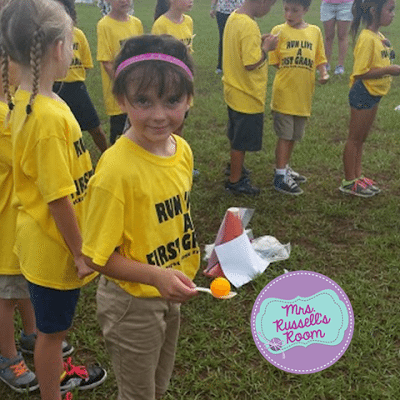 The first student was given a ball and a spoon. They ran to a spot a few yards away, balancing the ball in the spoon. Then they transferred the ball to their teammates spoon. The winning team completed a full relay first! We had some extra field trip money and we got each kid a shirt! 🙂 We got to pick our team colors! 🙂 The yellow was so bright and cheery! 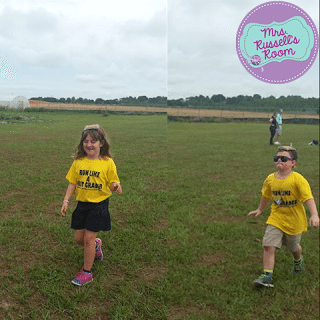 🙂 Every year we get shirts, and I see a TON of our second graders wearing their field day shirts from the year before…so I KNOW they love them! These events can’t be done without a strong leader! 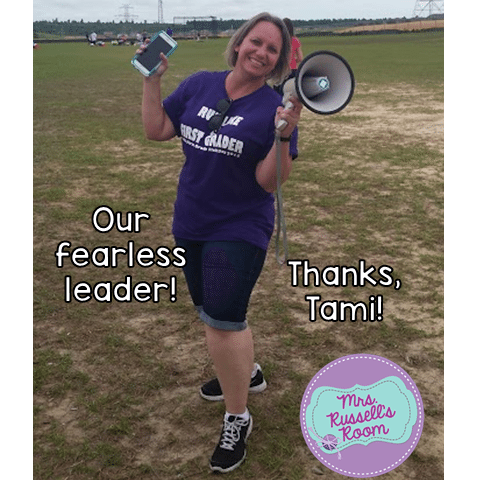 I am so glad that Tami stepped up to lead us this year! It was her first time running something this big, but she did a FANTASTIC job! I would love to try this. Do you have printables you would be willing to share? I would be happy to purchase them. Thank you for sharing engaging activities. I would also love to try this! Do you have printables for this? Thank you for sharing! I don’t, my old teammate does though. I will check with her and see if she has it somewhere that’s digital! Do you have printables for this? This would be so helpful at my school!! This looks great. 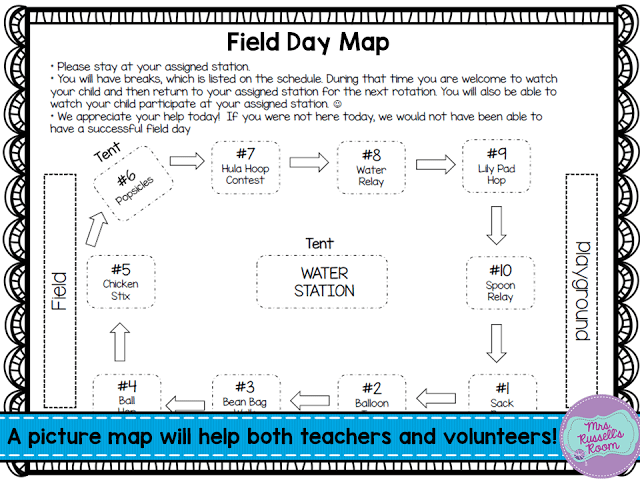 Is there a TPT Field Day link that includes the printables and signs? I would love to purchase an editable version. Please let me know! Thank you! I am not sure if my friend who planned it has something up for this. I will reach out and ask. She is now on a different grade level, so, maybe not. I just had a blast participating and shared about it!